Myofascial Pain Syndrome (MPS) is a condition that affects those who have thick muscle tissue and is common among individuals suffering from Fibromyalgia. Between the muscle and fascia (this is where Myofascial Pain Syndrome gets its name) painful trigger points are to be found and it is these trigger points that produce the pain that is felt by the sufferer. These trigger points can cause pain to be felt through the sufferer's body when pressed upon. What Causes Myofascial Pain Syndrome (MPS)? A sufferer may experience several of the aforementioned symptoms and this may cause what is termed as 'referred pain'; this is in essence what Myofascial Pain Syndrome (MPS) amounts to. 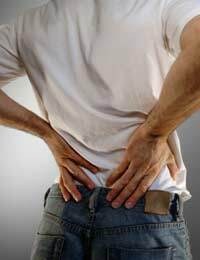 A person may suffer an injury or problem with another part of the anatomy and the referred pain may be felt elsewhere. It is important to understand that although Myofascial Pain Syndrome (MPS) is recognised as a condition not all doctors are convinced of its existence and that sometimes it can be put down to being a psychosomatic illness. This is often the case too for Fibromyalgia sufferers who exhibit a great many symptoms. At this juncture it is wise to note that only after an accurate diagnosis has been made can any treatment for this condition be carried out. Your doctor may wish to carry out a number of tests and also refer you to a consultant for specialist medical advice before agreeing on any course of treatment. It is useful to note that this process may take some time if you are using the National Health Service so you should be prepared for a lengthy period of time to elapse before any definitive diagnosis is decided upon. Once the problem has been accurately diagnosed your doctor will decide which course of treatment is best for you to undertake. This may not necessarily include medication but in some instances, depending on the severity of the condition, low dosages of anti-depressants may be prescribed. These anti-depressants act in two ways: (1) as a means of helping alleviate feelings of depression and (2) as a way of relieving pain; you should note that some anti-depressants also act as pain relief medication but your doctor will explain to your exactly what the medication he or she has prescribed for you will do. It may be necessary for you to visit a physiotherapist or chiropractor - at your doctor's instigation and they may help you embark on what is generally described as a course of muscle manipulation. At this point the physiotherapist will provide you with a schedule of exercises to perform and also will manipulate those muscles were trigger points are active. Also there may be cause for injection of local anaesthetics into the trigger points but these injections will only work for short periods of time and will provide pain relief only for a short time. Another process referred to as 'dry needling' can be used whereby a needle is inserted into the muscle where the trigger point is located, thus disrupting the flow of pain receptors. Again this will be at your doctor's discretion and only after he or she has made an accurate diagnosis. Another important aspect of the treatment is to relieve stress as much as possible. You should - where possible - try and eliminate as much stress from your everyday life as you can. As we have said the aforementioned techniques will only be employed (a) after your doctor has made an accurate diagnosis and has eliminated all other causes and (b) once he or she is sure there is a need to bring them into play. Again it is useful if you can make a diary or log of your experiences so that your doctor may be able to make a diagnosis more quickly and also have a better understanding of how you are coping with Myofascial Pain Syndrome (MPS).